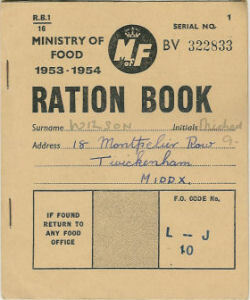 Rationing | The Dacorum Heritage Trust Ltd.
DACHT : One of the last Ration Books to be issued, 1953 – 1954. DACHT: 62.18a.1. The Government established British Restaurants, which provided a meal without the need to use ration coupons. 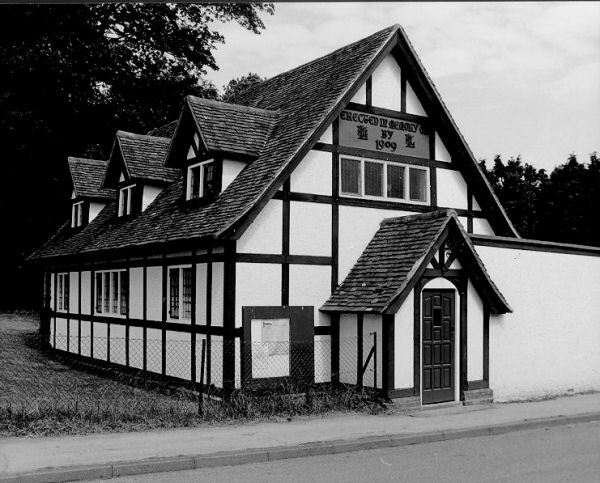 This is the British Restaurant at the Village Hall, Rucklers Lane, Kings Langley. DACHT: 62.12.14. One of John Dickinson’s fleet of lorries at Apsley Station shown with gas trailer to replace the normal petrol supply. To ensure that everyone had an equal supply of basic essentials, a system of rationing was introduced. Ration books were distributed, which contained coupons to be exchanged for foodstuffs. The amount of each rationed food was expressed by weight; for example 4oz of butter. Only meat was expressed in terms of money, which allowed a certain degree of flexibility, as a larger amount of a cheaper cut, or a smaller amount of a more expensive cut could be exchanged for a coupon. 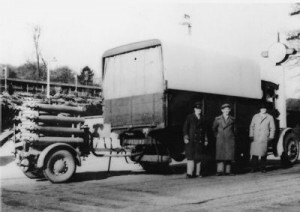 Government campaigns such as ‘Dig for Victory’ were introduced to ensure a supply of vegetables, which people could grow in their own gardens. Food rationing continued long after the war, as the rationing book from 1953-1954 displays. Meat was the last product to be rationed and rationing finally ended in 1954.